Hampton Lake, South Carolina prides itself as one of the most exclusive and distinguished communities in the country. As an eloquent testimony to its splendid class, Hampton Lake was bestowed in 2009 with the highest honor by the National Association of Homebuilders (NAH) as the top ranking “Best in American Living” community in the country. This award, for the number one position in communities with over 151 homes, which is recognized as the Oscars of the home building industry, is but a tribute to the finest living spaces and comforts that it offers to its residents. 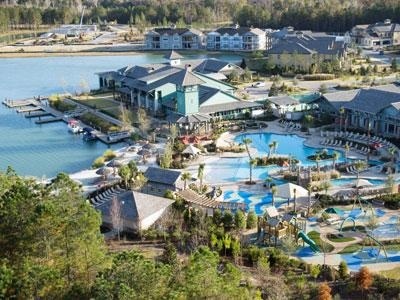 The unique feature of Hampton Lake is the “lake”, which is the first private lake community in the Hilton Head area covering 165 acres of pristine water, which makes it the largest body of freshwater in the area. Whether you look at it from the perspective of living, playing, fishing, boating or reveling and reaching out to family and friends, Hampton Lake is a remarkable place to call home. The lake throbs with hybrid-striped bass, the large-mouth ‘tiger’ bass, bluegill, and threadfin shad. It ranks among one of the finest fishing lakes in the Southeast. Imagine having this sheer luxury of nature right in your backyard. One of the special highlights of the community is its unique Lakeside Village, which boasts of an array of very exclusive amenities that are rarely found in a private community but often found at some of the most premium destination resorts. The Village offers you the luxury of three pools, which include a family-friendly pool with the Adventure Lagoon which is a lazy river in the style that you find at top resort hotel. If you are looking for peace and tranquility at the pool, you have the choice of an adult Cool Pool. For children, there is a dedicated Kids Pool. The Village outdoors are flanked by a sandy beach, a basketball court, a volleyball court, rental kayaks and boats, and the starting of the Greenways Trail System. The indoor amenities at the Village are no less amazing than the outdoors. You have a premier spa facility, a state of the art exercise and fitness center, a laid-back and friendly Backwater Bill’s Lowcountry Grill, Doc’s Boathouse tackle shop, and Mother Nature’s eco-museum. The chances of you being bored are extremely low. The community is located in Bluffton, barely 15 minutes away from Hilton Head Island, which is widely regarded as one of the most sought-after oceanfront resort communities in the United States. Since it is a new community the homes are up-to-date gorgeous, with outdoor living spaces to rival any homes in the country. And, of course, many of the beautiful homes have their own dock on the lake, where the owners can take their boat out with friends for an evening of entertaining or catching lots of fish … guaranteed! If you have questions about specific homes or real estate in general, contact us. We're happy to help find your dream home or lot to build it on.